Today we’re reporting some news that we’ve picked up on through our affinity networks. University students in Bangladesh have been protesting over the course of this week and facing intense brutality and repression. Starting on April 8th with a protest by students at Dhaka University, students took to the streets and staged sit-ins in protest of new reforms to the quota system used for government jobs. The government, ruled by the dominant Awami League, announced reforms that would reserve 56% of government jobs via the quota system for minorities and descendants of the Mukti Bahini (veterans of Bangladesh’s 1971 national liberation war against Pakistan). Around 30% of these jobs would be reserved for the children of Mukti Bahini, who make up less than 10% of the population. This sparked outrage, as it would leave over 90% of the population to compete for 44% of government jobs. Government & civil service jobs are one of the few stable means for graduates to make a living in Bangladesh, carrying benefits, protections, and job security not available in most industries. 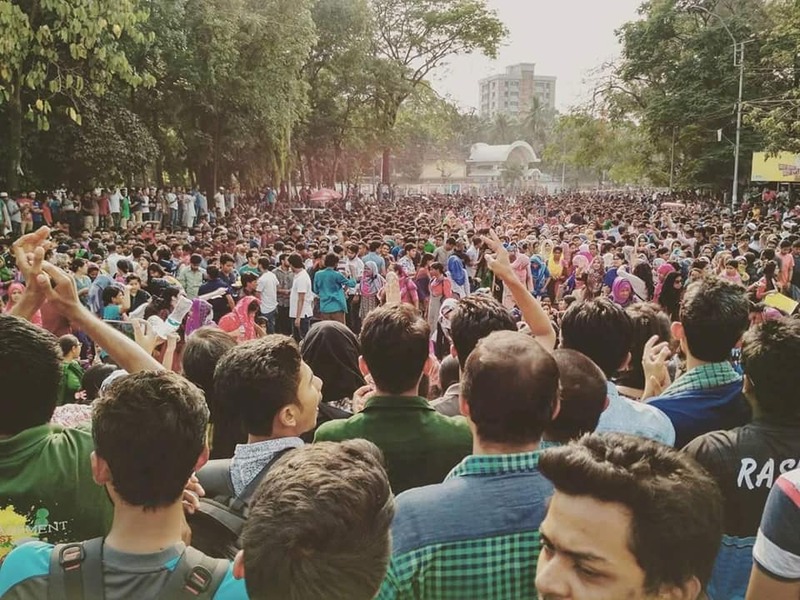 Student protestors, according to a confidential source in Bangladesh, have mostly focused their ire on the quotas for descendants of the Mukti Bahini, calling for more equitable reforms. Students believe that the current quota system disadvantages most students and reflect a government system that functions based off family history & connections, rather than merit. They want to see a system that is more meritorious. On April 8th, DU students protesting in the capitol city of Dhaka blocked Shahbagh road, one of the busiest roads in the city. 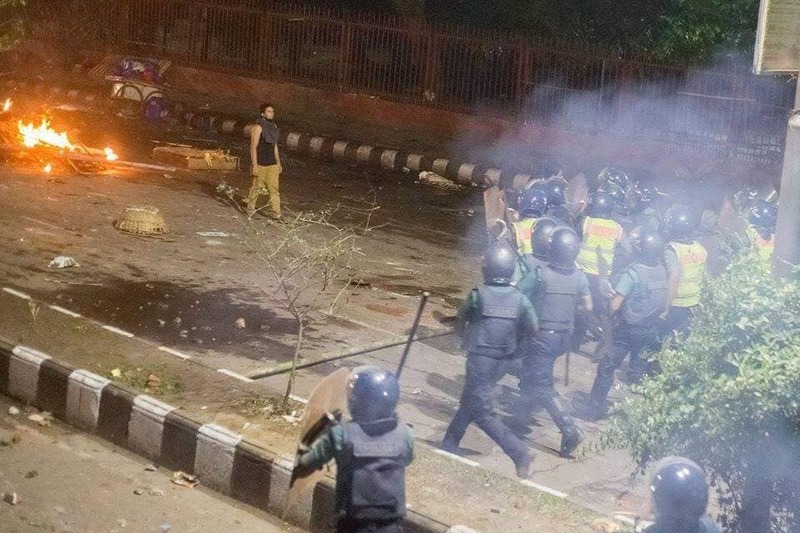 Power was cut off to the University area and, soon afterwards, police came in and began to attack students by firing rubber bullets and tear gas. Some students defended themselves, engaging in street battles with the police through the night. Many students were injured and, according to some reports, two have died. Students also faced attacks from armed para-military student forces who are part of the Bangladesh Chatro League. As this was going on, the home of the Vice Chancellor of DU was ransacked. Inside Bangladesh, there has been almost total media silence on the protests. At the direction of the government, most news sources have either ignored the protests or only focused on the ransacking of the Vice Chancellor’s house. Some protestors believe this was staged by government forces in order to de-legitimize the protest. 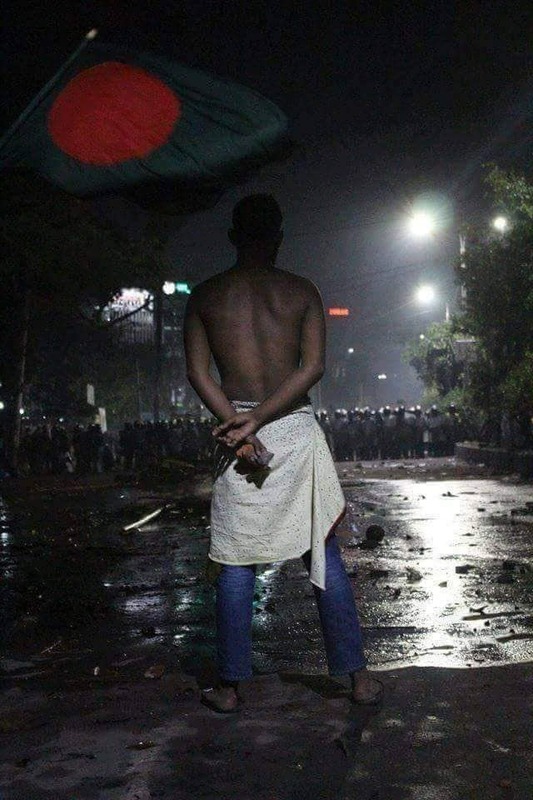 Although we, as anarchists, are wary of narratives that would blame “outside agitators” for destructive actions, our contact believes this is the case because the student protestors were all gathered on Shahbagh road facing off with the police that night. Students have been sharing live videos and pictures on facebook, pleading for international media attention–this is what initially caught our eye and inspired us to publish something, to at least get international leftist attention to the issue. Since the protests started at Dhaka University, they have spread through all of the public universities in Bangladesh. After the initial brutality, DU students locked themselves inside of buildings on campus. The students face insufficient resources and injuries–including respiratory difficulties–due to the attacks by police and para-militaries. We see parallels between their situation and the situation of students in Peru and France who have faced attacks from the police and fascist forces as they occupy their own schools. In Bangladesh, the stand-ins for the fascists are the Bangladesh Chatro League (BCL), who have a slightly more complex history. The BCL started in 1948 as a student political organization; post-independence they have operated most prominently as the student-wing for the Awami League, the current dominant party in Bangladesh. They have operated as a para-military that seeks to enforce Awami League decisions and regularly coerce or threaten students living in DU residence halls into joining. One BCL leader even went to the extreme measure of cutting the tendons off a protestor’s foot, posting it up as a threat to other protestors. The Awami League itself, nominally a secular, nationalist party with socialist leanings, has more recently functioned as an increasingly autocratic nationalist party that manages Bangladesh’s status as a nation hyper-exploited by global markets. As you can imagine, the administration of the University did not take any effective action to defend the students from attacks. On April 11th, Prime Minister Sheikh Hasina suddenly announced that the quota system would be abolished. Our sources say that students are not happy with this result. The demand for quota reform, not abolition, was intentional. Students recognize that many of the quotas for ethnic & religious minorities and disabled people are necessary, and had largely focused on the absurd veteran quotas. The move has been described as “another act of dirty politics,” so that the government may blame future problems or anger–particularly regarding discrimination against minorities–on the students. Currently, students are planning to continue protesting. We will update this story as more events unfold and information becomes available. The situation & movement in Bangladesh is a complex one. There are elements we are sympathetic to, as “leftists,” “anarchists,” “autonomous” organizers, and so on. Students have demonstrated a recognition of how the police are acting only to enforce the will of the state, not protect protestors, and how the police collaborate with the armed goons of the BCL. The movement also demonstrates an awareness of deeper conditions of economic precarity and government corruption, which have stifled the life chances of Bangladeshis. At the same time, the movement contains capitalist & neo-liberal influences. For example, many of the protestors object to the quotas on the grounds that “Meritous [sic] students dont get what they deserve.” In the language of merit, we see parallels with the neoliberal language of individual responsibility, merit, and success–lies which obscure the reality of how this entire economic system leaves the vast majority of us isolated, exhausted, and impoverished. This movement will likely find its limit, or the point at which it collapses back into normalcy, at the point where it can guarantee to students a place in the middle-class or government while failing to challenge the bankrupt political and economic system as a whole. We do not aim, in reporting on these events, to idolize or glorify the movement. Instead, we hope this report will help bring awareness to an issue of interest and invoke a deeper discussion on the complex political forces at play here. Furthermore, we are interested in finding and giving voice to the leftist and autonomous perspectives within this student movement, those voices which agitate for more than just quota reform. Therefore, we present this as a call for autonomous leftist Bangladeshi students or organizations to engage with us so we may present your perspectives and your struggles against capitalism & the State, against the quota system and its world. Submit your analysis, report-backs, statements, and more to us and help us open up an international dialogue.